Ingredients: Aqua, Sodium Laureth Sulfate, Cocamide DEA, Cocamidopropyl Betaine, Sodium Chloride, Dimethicone, Glycerin, Hydrolyzed Wheat Protein, Panthenol (Provitamin B5), Cocamide MEA, Polyquaterium-10, Tetrasodium EDTA, Imidazolidinyl Urea, Phenylpropanol, Propylene Glycol, Methylisothiazolinone, Parfum, Mica, Titanium Dioxide. 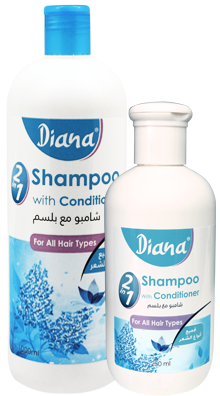 Properties: Diana® Shampoo with Hair Conditioner 2 in 1 for All Hair Types is a key element for your daily hair care routine. The shampoo cleanses your hair and maintains its strong and healthy texture, and the conditioner gives it a long lasting soft, silky and beautiful look. Directions: Apply Diana® Shampoo with Hair Conditioner 2 in 1 for All Hair Types on your hair, massage gently for about 3 to 5 minutes then wash it out. Repeat as necessary. Ingredients: Aqua, Sodium Laureth Sulfate, Cocamidopropyl Betaine, Cocamide DEA, Sodium Chloride, Hydrolyzed Collagen, Hydrolyzed Wheat Protein, Cocamide MEA, Tetrasodium EDTA, Propylene Glycol, Imidazolidinyl Urea, Phenylpropanol, Methylisothiazolinone, Parfum, Colorants. 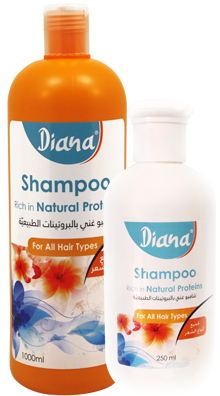 Properties: Diana® Shampoo Rich in Natural Proteins is one of the best shampoos to cleanse, strengthen and protect your hair. Natural Proteins such as collagen and wheat give back your hair its strong, smooth, silky, shiny and lively texture. Enjoy your healthy and beautiful hair look with Diana® Shampoo Rich in Natural Proteins. Directions: Apply Diana® Shampoo Rich in Natural Proteins on your hair, massage gently for about 3 to 5 minutes then wash it out. Ingredients: Aqua, Sodium Laureth Sulfate, Cocamide DEA, Cocoamidopropyl Betaine, Hydrolyzed Keratin, Chamomilla Recutita (Matricaria) Flower Extract, Sodium Chloride, Propylene Glycol, Glycerin, Tetrasodium EDTA, Butylene Glycol, Phenoxyethanol, Ethylhexylglycerin, Potassium Sorbate, Imidazolidinyl Urea, Phenylpropanol, Methylisothiazolinone, Parfum, CI19140, CI42090, CI14720. 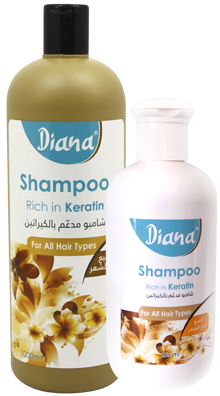 Properties: Diana® Shampoo Rich in Keratin is one of the best shampoos to cleanse, strengthen and protect your hair. Keratin is a key protein that gives back your hair its strong, smooth, silky, shiny and lively texture. Enjoy your healthy and beautiful hair look with Diana® Shampoo Rich in Keratin. Directions: Apply Diana® Shampoo Rich in Keratin on your hair, massage gently for about 3 to 5 minutes then wash it out. Afterwards, you may use Diana® Hair Conditioner Rich in Keratin. Ingredients: Aqua, Sodium Laureth Sulfate, Cocamide DEA, Cocamidopropyl Betaine, PEG-7 Glyceryl Cocoate, Sodium Chloride, Mamushi (Snake) Oil, Chamomilla Recutita (Matricaria) Flower Extract, Serenoa Serrulata (Saw Palmetto) Fruit Extract, Glycerin, Tetrasodium EDTA, Potassium Sorbate, Imidazolidinyl Urea, Phenoxyethanol, Caprylyl Glycol, Butylphenyl Methylpropional, Linalool, Parfum, CI14720, CI19140, CI42090. Properties: Diana® Snake Oil Shampoo fortifies and thickens the hair. Its special formula, with Snake Oil, Chamomile Extract and Saw Palmetto Extract revitalizes the hair. Regular use of Diana® Snake Oil Shampoo gives your hair a fuller, healthier, shinier and more attractive look. Directions for Use: Apply Diana® Snake Oil Shampoo to damp scalp, gently massage for 3 to 5 minutes then rinse thoroughly with water. Avoid drying with excessive heat. Ingredients: Aqua, Cetrimonium Chloride, Cetearyl Alcohol, Glycerin, Propylene Glycol, Dimethicone, Sodium Lauryl Sulfate, Sodium Cetearyl Sulfate, Tetrasodium EDTA, Imidazolidinyl Urea, Phenylpropanol, Methylisothiazolinone, Parfum, CI19140. 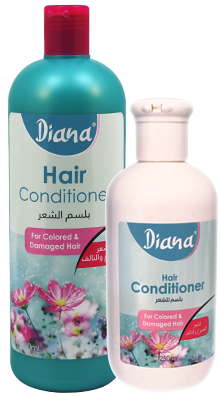 Properties: Enjoy your beautiful hair look with Diana® Hair Conditioner. It replenishes hair natural moisture and gives it a long lasting, soft, silky, shiny and healthy look. Directions: After washing shampoo off your hair; apply Diana® Hair Conditioner and leave it for 3 to 5 minutes before washing it out. Ingredients: Aqua, Cetrimonium Chloride, Glycerin, Cetearyl Alcohol, Aloe Barbadensis (Aloe Vera) Leaf Juice, Equisetum Arvense (Horsetail) Extract, Salvia Officinalis (Sage) Extract, Rosmarinus Officinalis (Rosemary) Leaf Extract, Dimethicone, Sodium Lauryl Sulfate, Sodium Cetearyl Sulfate, Propylene Glycol, Tetrasodium EDTA, Potassium Sorbate, Imidazolidinyl Urea, Phenylpropanol, Methylisothiazolinone, Parfum, CI19140, CI14720. 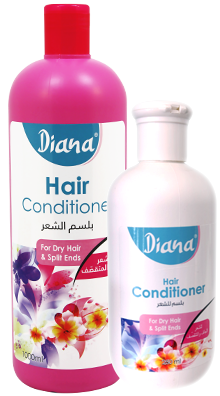 Properties: Diana® Hair Conditioner for Dry Hair & Split Ends is especially made to moisturize the hair, strengthen it and prevent its breakage. Its unique formula, rich in Aloe Vera Extract, Horsetail Extract, Sage Extract and Rosemary Extract, provides deep recovery and conditioning for dry hair and split ends. It gives your hair a long lasting, soft, silky, shiny and healthy look. Directions: After washing shampoo off your hair, apply Diana® Hair Conditioner for Dry Hair & Split Ends from root to tip and leave it for 3 to 5 minutes before washing it out. Ingredients: Aqua, Cetrimonium Chloride, Cetearyl Alcohol, Glycerin, Helianthus Annuus (Sunflower) Seed Oil, Aloe Barbadensis (Aloe Vera) Leaf Juice, Punica Granatum (Pomegranate) Extract, Dimethicone, Sodium Lauryl Sulfate, Sodium Cetearyl Sulfate, Propylene Glycol, Tetrasodium EDTA, Potassium Sorbate, Imidazolidinyl Urea, Phenylpropanol, Methylisothiazolinone, Parfum, CI42090, CI14720. Properties: Diana® Hair Conditioner for Colored & Damaged Hair is especially made to protect your hair and maintain its freshly done color. Its unique formula, rich in Sunflower Oil, Aloe Vera Extract and Pomegranate Extract, works on strengthening the hair, protecting it and extending the life span of the color. It gives your hair a long lasting, soft, silky, shiny and healthy look. Directions: After washing shampoo off your hair, apply Diana® Hair Conditioner for Colored & Damaged Hair and leave it for 3 to 5 minutes before washing it out. Ingredients: Aqua, Cetrimonium Chloride, Cetearyl Alcohol, Glycerin, Hydrolyzed Keratin, Propylene Glycol, Dimethicone, Sodium Lauryl Sulfate, Sodium Cetearyl Sulfate, Tetrasodium EDTA, Butylene Glycol, Phenoxyethanol, Ethylhexylglycerin, Imidazolidinyl Urea, Phenylpropanol, Methylisothiazolinone, Parfum, CI19140, CI42090, CI14720. Properties: Diana® Hair Conditioner Rich in Keratin is one of the best conditioners to nourish your hair and give it a healthy look. Keratin is a key protein that gives back your hair its strong, smooth, silky, shiny and lively texture. 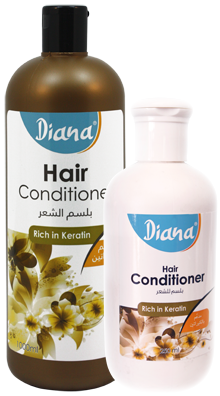 Enjoy your beautiful hair look with Diana® Hair Conditioner Rich in Keratin. Directions: After washing Diana® Shampoo Rich in Keratin off your hair, apply Diana® Hair Conditioner Rich in Keratin and leave it for 3 to 5 minutes before washing it out. Ingredients: Cocos Nucifera (Coconut) Oil, Mineral Oil (Paraffinum Liquidum), Prunus Amygdalus Dulcis (Sweet Almond) Oil, Caprylic/Capric Triglyceride, Daucus Carota Sativa (Carrot) Seed Oil, Simmondsia Chinensis (Jojoba) Seed Oil, Argania Spinosa (Argan) Kernel Oil, Triticum Vulgare (Wheat) Germ Oil, Tocopheryl Acetate (Vitamin E), Benzyl Alcohol, Coumarin, Parfum. 1. Pour a small amount of the oil into the palm of your hand. 2. Apply it evenly on clean skin. 3. Gently massage in circular motion until fully absorbed. Repeat until your entire body is covered. 4. Tan for 10 to 15 minutes on each side of your body. Avoid intensive mid-day sun exposure as this is not a sun protection product. 5. Rinse the tanning oil off the body and follow with a sun protection lotion. Ingredients: Prunus Amygdalus Dulcis (Sweet Almond) Oil, Tocopheryl Acetate (Vitamin E). Properties: Diana® Sweet Almond Oil, for multiple usages, works effectively on the skin and the hair. Its natural and intense formula, with Vitamin E, strengthens and protects the hair as well as nourishes and moisturizes the skin to maintain its firmness and elasticity. It also helps in reducing the appearance of stretch marks on pregnant ladies. Directions for Use: Apply the oil on the skin or the hair. Gently massage until full absorption. Ingredients: Mamushi (Snake) Oil, Alpha-Isomethyl Ionone, Benzyl Alcohol, Benzyl Salicylate, Butylphenyl Methylpropional, Citral, Citronellol, Geraniol, Hexyl Cinnamal, Limonene, Linalool, Parfum. Properties: Diana® Pure 100% Snake Oil repairs your hair from root to tip and restores its silkiness and smoothness. It gives you a revitalized, long, beautiful and attractive hair look. Directions for Use: Gently massage a small amount of the oil in circular motion all over the scalp. Leave it on for an hour then wash it out. Use two or three times per week. Ingredients: Mamushi (Snake) Oil, Prunus Amygdalus Dulcis (Sweet Almond) Oil, Ricinus Communis (Castor) Seed Oil, Olea Europaea (Olive) Fruit Oil, Canola Oil, Vitis Vinifera (Grape) Seed Oil, Helianthus Annuus (Sunflower) Seed Oil, Prunus Armeniaca (Apricot) Kernel Oil, Coumarin, Linalool, Parfum. Properties: Diana® Hair Oil rich in Snake Oil nourishes your hair, protects it, prevents its damage and restores its natural lustre and strength. It leaves your hair soft, smooth and manageable. Ingredients: Petrolatum, Cocos Nucifera (Coconut) Oil, Mineral Oil (Paraffinum Liquidum), Beeswax, Paraffin, Olea Europaea (Olive) Fruit Oil, Helianthus Annuus (Sunflower) Seed Oil, Prunus Amygdalus Dulcis (Sweet Almond) Oil, Tocopheryl Acetate (Vitamin E), Retinyl Palmitate (Vitamin A), Phenoxyethanol, Caprylyl Glycol, Amyl Cinnamal, Limonene, Hexyl Cinnamal, Parfum, C.I.47000, C.I.60725. 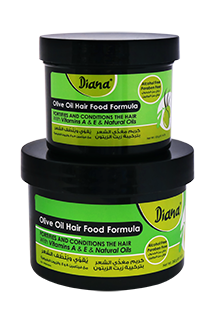 Properties: Diana® Olive Oil Hair Food Formula fortifies and conditions the hair. With Olive Oil, Vitamin A, Vitamin E and Coconut Oil, Sweet Almond Oil and Sunflower Oil, this product thickens your hair, revitalizes it and gives it a strong structure and a lively look. Directions for use: Apply a small amount of the cream on the hair. Use once or twice a day, as desired. Suitable for all hair types. Ingredients: Petrolatum, Cocos Nucifera (Coconut) Oil, Mineral Oil (Paraffinum Liquidum), Tocopheryl Acetate (Vitamin E), Retinyl Palmitate (Vitamin A), Lanolin, Paraffin, Phenoxyethanol, Caprylyl Glycol, Alpha-Isomethyl Ionone, Butylphenyl Methylpropional, Citronellol, Eugenol, Linalool, Parfum, C.I.47000, C.I.60725. 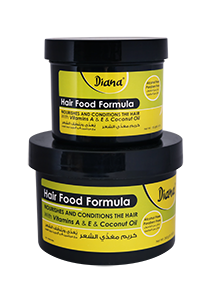 Properties: Diana® Hair Food Formula nourishes and conditions the hair. With Vitamin A, Vitamin E and Coconut Oil, this product gives you a healthier, softer and shinier look.